ALARIN AIRCRAFT HINGE was formed in 1988 when current ownership acquired the aircraft hinge manufacturing operations of the Homer D. Bronson Company, a leader in the engineered hinge market since 1839. 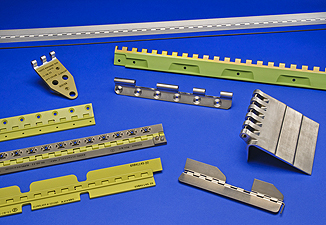 Since the time of the acquisition, Alarin has grown to become one of the leading worldwide manufacturers of precision aircraft hinges and related assemblies. This growth could not have been achieved without our focus on continuous improvement and the contributions of our employees, a number of which have been with the company since before the 1988 acquisition. Alarin supports its customers with a broad range of their needs including spot-buys for product, spares, MRO or AOG requirements, long-term Min/Max inventory management and large statements of work under long-term contracts. Alarin's capacity and experience allow us to manufacture aircraft hinges supporting multiple commercial and military aircraft platforms including those with the highest monthly build-rates. All of our products are manufactured in-house using extensive lean practices which are a key element of the company's manufacturing capabilities. Alarin's philosophy is to make customer focused investments that will allow the company to provide a range of capabilities and products that will support our customers' present and future requirements. Alarin recently increased its manufacturing capacity by increasing the size of our facility and by investing in new production and inspection equipment as well as specialized hinge drilling, milling and finishing machines that were custom built by the company. Alarin also makes on-going investments in research and development that allow us to continue to be a leader in hinge manufacturing. Recognizing their importance to the value proposition we offer customers, Alarin continuously invests in our workforce, their training and the tools available to them.